In case you missed all the excitement, there’s been a flurry of Thanksgiving-related gluten-free posts this week. They’ve been prompted by none other than the Gluten Free Girl, herself, Shauna Ahern. I contributed a not-quite-perfect recipe to Shauna’s round-up. But, I couldn’t leave things like that. I need to follow up with a scrum-dilly-umptious recipe. Gluten-free, vegan walnut pie is just the thing. What? You’ve never heard of walnut pie before? Okay, you got me. I hadn’t either. But, remember how I told you I have lots of walnuts right now? 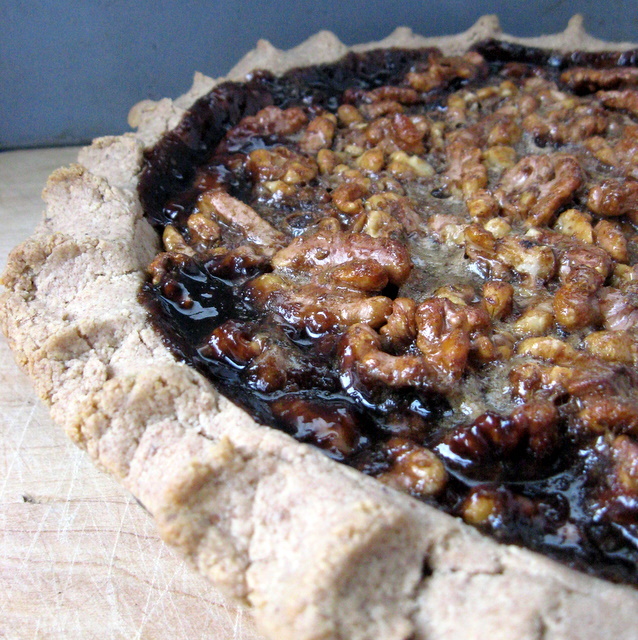 I decided that pecans shouldn’t get all the glory, and walnuts could be stars in the pie world, too. This recipe is hardly original. Instead, I adapted from a couple of other recipes. The crust is a veganized version of Shauna’s classic gluten-free crust. Please read her blog for her detailed instructions and pictures. The only changes I made were to use Earth Balance soy-free spread in place of the butter, and coconut oil in place of the lard (though next time I’d use palm shortening), and a flax egg in place of the flax. I also tossed in 1 t. apple cider vinegar with the wet ingredients. My version did require a bit more water than hers – possibly because my flours were dried out from being in stored in the fridge. The filling is an adaptation of a pecan pie recipe on Get Sconed. Mix the syrups, salt, and cinnamon in a small saucepan. Heat until simmering, and simmer for 5 minutes, stirring constantly. Remove from heat. Blend together the almond milk, flax seed, vanilla and starch. Add the syrup mixture and blend well. Add the walnuts and stir to combine. Pour into pie crust and bake 35-40 minutes, until crust is browned and filling is bubbling and set. Find other slightly indulgent recipes at Slightly Indulgent Tuesdays. Find more gluten-free goodies at Gluten-Free Wednesdays. This entry was posted in Blogger Community, desserts, flax seed, nuts, vegan. Bookmark the permalink. This sounds fantastic Deanna! I love brown rice syrup. Can you send me a piece of this pie please? Actually, I remember hearing of walnut pie a few years ago – but have never eaten it! I KNOW I’d like it though, I adore all “translucent” pies (like pecan). This looks wholesome yet decadent! Wow Deanna, that looks fabulous! I’ve never heard of sorghum syrup. Is it similar to brown rice syrup? I will add this to our pie round-up on Go Dairy Free next week (Monday). Thanks for letting me know! Sorghum syrup is a little like a cross between brown rice syrup and molasses – it’s darker and richer than brown rice syrup. You could skip it and use all brown rice syrup. I just like the depth that sorghum adds. Walnut pie sounds wonderful to me! Your crust and filling look scrumptious. What a truly appetizing gf walnut pie! !